When we discuss digital signage, we often imagine a screen which plays content constructed from different media types, such as live TV, video clips, Flash, HTML5, etc. Most digital signage software playing these content types are what we call a playlist. A playlist is simply a media list played in sequential or shuffled order. However, because the screen is visual and can play more than one piece of media at the same time, a digital signage playlist can range from being very simple to very complex. 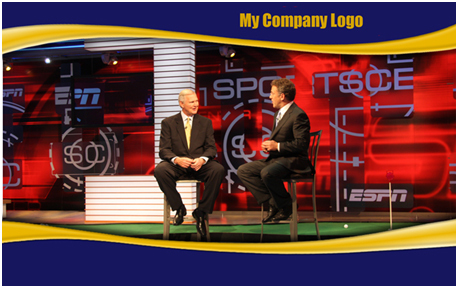 In most digital signage software you can have the ability to split the screen into multiple sections. Once you split the screen, every section on the screen becomes a separate playlist. Let’s first understand how a single playlist, with only one zone playing, works. A regular playlist is where we have a set of files playing in a sequential order. For example, like the Play Order list below, we have seven media spots which come from different file types and every spot will play in the same index order on every loop. The software allows you to rearrange the playlist order, but every spot plays one time per loop. The loop duration is the total spot time which is 00:12:55. You can change the order of the campaign and even play an entirely new campaign list within the original campaign. The limitation of a standard playlist is that the content repeats itself very often and makes the display very monotonous and boring, which defeats the purpose of the digital signage function. One way to deal with it is to add more content to the loop and make it longer, or adding a feature where some spots within the playlist are dynamically rotating between a list of content in the same category. This function in UCView software is called sequential campaign. Sequential campaigns allow for you to rotate between a group of content within the same spot on the playlist. Looking at Figure 1 above, you can view the playlist in chronological order. Each content has a duration period, and once that duration period is complete, the next content will play. A sequential campaign is embedded as a spot within the playlist. When the playlist reaches that spot, it will trigger one of the contents to play from the sequential campaign. After that content finishes, it will continue on to the next content on the main playlist. The player will remember which content from the sequential campaign group was played last and it will play the next content in the next loop. For instance, index 3 in the main playlist is a spot. Once the main playlist reaches index 3 there will be a trigger for one of the content from figure 2 to play. Once that content finishes, it will return back to the main playlist and continue on to index 4. The same example can be seen in Safety Videos in index 7. Once it reaches that spot, a trigger will allow for one of the content in figure 3 to play. When that content finishes, however, it will start up an entirely new loop and a new content from the sequential campaign list will play. This enables variations in your content, so your customers won’t have to view the same content over and over again. Even though sequential is the most common order, there are other variations you can include to enhance your display. A few variations on your playlist include a change of a layout campaign, the one-time content, the cyclic content, full screen mode, and synced content. Let’s first take a look at the change, as depicted below, from the main layout into a layout campaign. While you are playing your main playlist, a trigger, which is located in the duration period below, will activate a multi-screen layout campaign to appear. A layout campaign with multiple sections will play different content in the zones you created. All content that is displayed in the layout campaign will correlate with your desired campaign name. The graphics below depict how the change from a main layout to a layout campaign will appear on your display. The Company News, which is in the main playlist below, will activate a trigger which then shows the layout campaign with multiple sections. The layout campaign is separated into three sections: main media, side banner, and side banner 2. Each one of the sections will display an content and play it for your audience. The layout campaign will play for a duration period, and once the layout campaign is finished it will return to the main playlist and play the next content on the list. Play once spot is another option you may use to change up your playlist. This means that your playlist will play a content at one particular time you select. For instance, you can have a content play every day at 1:00 pm only. This means that when you are playing your regular playlist, you can arrange for an advertisement to display once during that period of time. The cyclic spot is scheduled to play every timed amount of minutes. For example, you can organize the playlist so that one content plays every two minutes. The cyclic content, however, will not interrupt any content that were currently playing at that time, and will actually wait until another content finishes before it appears on screen. If you would like to promote a product, the cyclic content can be very useful for this purpose. You can trigger your playlist to include full-screen mode. A trigger in the playlist can change from a normal layout with multiple sections into full-screen mode. Full-screen mode is when one image, video, or content appears throughout the screen instead of being placed into sections. Full-screen mode will take over the entire screen and play just one content during that duration period; however, once the duration period is over, the ad will automatically transition into a normal layout campaign with multiple zones. You may also arrange for content to play in synchronization with another content. If two or more content complement each other, you may arrange for those content to play together during the same duration period. Change type of content to Synced and then check mark Sync with other content in order to have two or more content play in coordination. 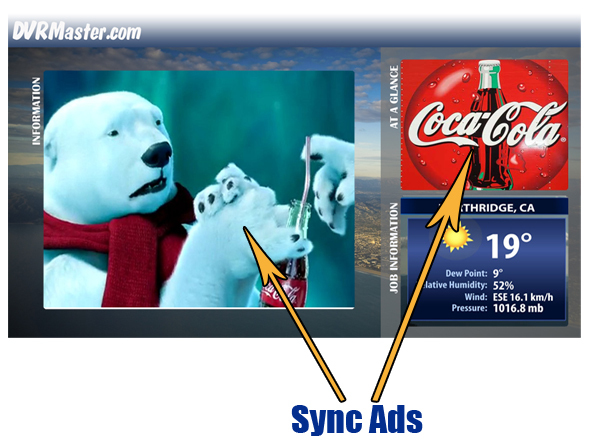 Synchronized content can be very useful for product promotions and advertisements. For example, like the image above, you can post a video in the main section and display an advertisement in the side banner. The playlist will trigger both content to play during the same time rather than at different times. Your playlist can be adjusted and customized to fulfill what you would like to display. Digital signage can be used to the fullest potential and adjusting a playlist for your audience can make your display more lively and engaging. If your business has many regular customers, modifying your playlist can be very useful and allows for your audience to view fresh content on a daily basis.